So, what does that question mean for fast food restaurants and suppliers? For McDonald’s, this was an opportunity to provide consumers with a look into exactly what makes up a Chicken McNugget. 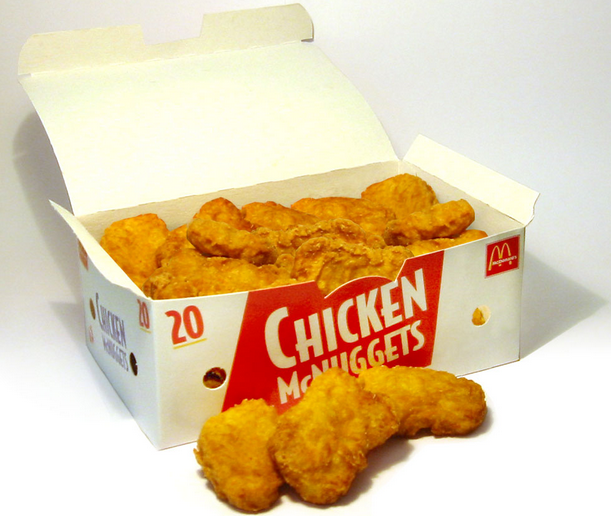 In several videos, a supply-chain manager for McDonald’s in London, Ontario, gives a tour of the McNuggets production and shows just how the tasty little treats are made. The product is comprised of pulverized chicken breasts, water, modified corn starch, salt, seasoning, and natural rosemary extract – no “pink slime” to be found anywhere! 1. Discuss eating habits. Poll students: who has eaten fast food in the past two weeks? Eaten Chicken McNuggets? 3. Review key aspects of developing a product positioning map, including determining the axis labels for positioning. 4. Divide students into teams. Use this information to develop a positioning map for McDonald’s. What are the axis labels? Why? 5. What products are competitors? 6. Have each team draw their map on the board.